W.C. Handy was the first to document "the blues", saying he heard it on a train platform in Tutwiler, Mississippi. Official Throwback Ladies Johnny Winter T Shirt. 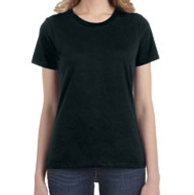 This is a comfortable 4.5 ounce 100% preshrunk combed and ringspun cotton anvil ladies Johnny Winter T-Shirt. Sizes run very true. Heather Grey is 90/10, any other heather colors are 60/40.